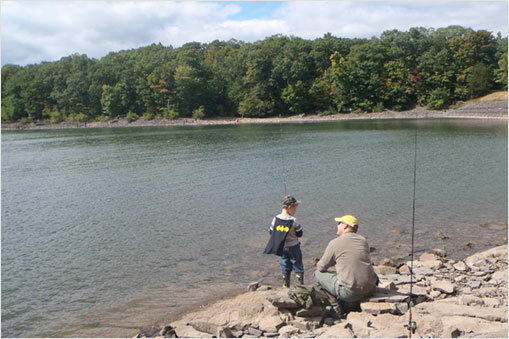 The New York City Department of Environmental Protection (DEP) today announced that it will host a youth fishing day at Lake Gleneida in Carmel on June 22. The event is being co-sponsored by the New York State Department of Environmental Conservation (DEC), which will supply fishing poles and bait to those who do not have their own. As part of the “I Fish NY Program,” the New York State fishing license requirement is waived for adults who want to fish during this event. A free DEP access permit will be required for participants over the age of 16. If adults do not have a free DEP access permit, applications and guest permits will be available on the day of the event, or a permit can be obtained online anytime by going to the DEP website. The 168-acre Lake Gleneida is home to many species of fish, including lake trout, bass and panfish. DEP and DEC staff will be available to teach participants how to fish and assist with fishing equipment. The event will take place from 10 a.m. to 2 p.m. Parking will be located along the lake on Route 6. For more information about the event, call DEP at (845) 340-7873.